It seems that summer has finally arrived (for a few days at least) with the past few days being very hot and humid. The weather forecast remains scary though, with the beebs animated one for today flashing lots of lightening in a dramatic fashion for tonight. Due to the sudden heatwave, this weekend has been a fight to acquire oomph to do anything. Nonetheless, I headed into town on Saturday to start collecting supplies for next weekend when I'm hoping to join Helen, Heather and a few others for a spot of dyeing. Reading Heather's extensive list of what we'll need to bring, I started off by buying cheap brushes and a bucket. Rubber gloves and a plastic dust sheet are still on my list, while I rescued newspapers from the recycling box. I ordered undyed yarn from Fyberspates at the beginning of last week so I'm keeping my fingers crossed my order shows up or there will be no dyeing for me! Being on jury service this week means that I can't get the delivery sent to work, so I'm going to have to pick the parcel up from wherever Royal Mail takes it when they can't get you to answer the door. This used to be a sorting office in town, but I think it's been closed recently which means I have no idea where I'm going to have to go to fetch an undelivered parcel. In other news, the eyelets are all set in the tent. I waited until early Saturday evening, when things cooled just a little to show Dave how to set an eyelet. He got started on the remaining eyelets early (ish) on Sunday morning (before the main heat of the day) and tells me they're all in. I haven't seen the finished eyelets myself yet, as he took the opportunity to douse the lawn in water and lawnfeed so everything became very damp for a short while. By the time things had dried out again, it was too hot to think about hefting canvas about so I sat in the shade, playing with beads and mohair. I'm still at the experimental stage, but I'm pleased with what I've done so far. No photographs as my brain was melting by the time I was done (even sat in the shade) and I couldn't muster enough energy to fetch the camera. Finally, I found this in the market on Saturday. In fact I was rather amused by this turn of events, with both Dave and I agreeing that it was kind of cool to each purple cauliflower cheese. 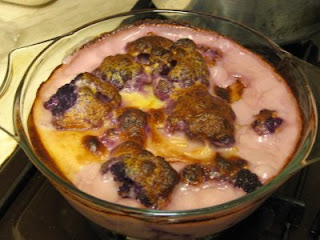 It was also very tasty, in a purpley, pink goodness sort of way. Are you sure that cauliflower was some evil farming experiment gone wrong. Ha ha, that's amazing! I wonder if you could get the same effect by watering veggies with food colouring? 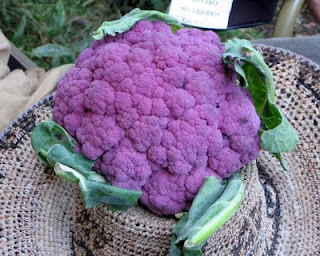 Wow - how much nicer would the world be if all veg was purple?! !